Follow the day's readings at the click of a button or sit back and listen while the whole of a book is read to you. If you wish to listen to the readings for another day then just select the appropriate date and click on the chapter. This version is a DVD for use in a computer. The DVD is a collection of mp3 files, one for each chapter of Scripture, and a small program written especially for use with them (screen shot above). 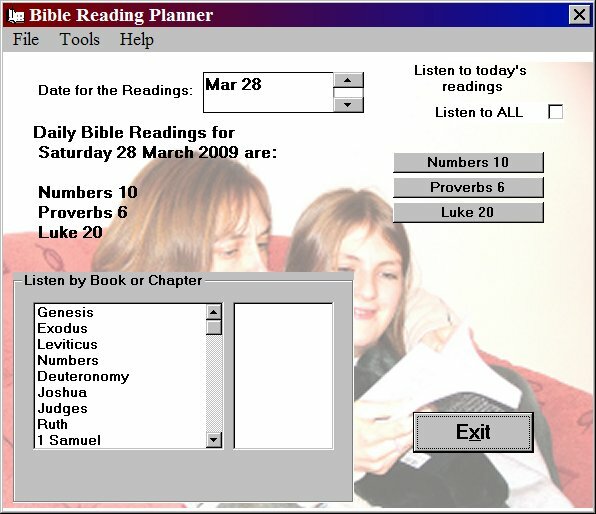 The program and mp3 files load onto your computer and enable you to play the readings for the current day according to the Bible Reading Companion, or for any other day of the year that you choose. There is also the option to listen to either a particular chapter or a whole book. Just select what you want to hear and click the button. The readings, which are all taken from the Authorised (King James) Version, are read by 60 brothers in such a way that you do not get the same brother reading two chapters on the same day or two consecutive chapters of the same book. There is no announcing of the chapters beforehand, you know you have moved on to the next chapter as the reader's voice changes. The DVD requires Microsoft Windows XP or later, Windows Media Player, a DVD drive, any sound card, speakers and at least 5GB of space on your hard drive. The cost is £17.50 plus £2.50 postage and packing to any UK address. Contact Sales@DailyBibleReadings.org.uk for prices for other countries. Local currency payment can be made in Australia, other overseas payments can be made via PayPal in pounds sterling. This figure includes a donation to Christadelphian Bible Mission Project Aid Fund of £15.00. If you wish to know more please email Enquiries@DailyBibleReadings.org.uk or place an order at Sales@DailyBibleReadings.org.uk giving your name and full postal address. A copy will then be sent to you along with an invoice for you to pay.